(NaturalNews) Honey, referred to by some as "Mother Earth's Liquid Gold," has been around for centuries. It has been part of many traditional medicines, including Ayurvedic treatments. And in ancient Greece, Hippocrates used it in nearly all his medicinal formulations. Raw honey owes its remarkable benefits to a special cocktail of natural sugar, trace enzymes, minerals, vitamins and amino acids. Not all honey is created equal though. 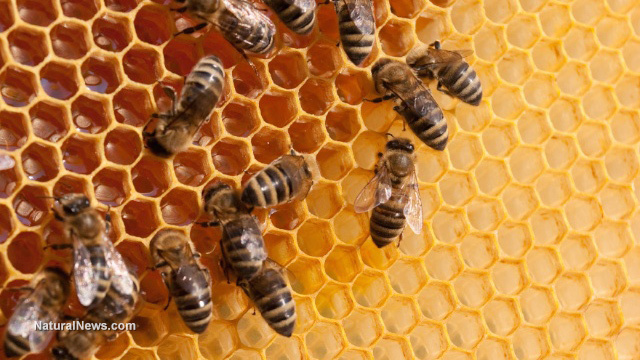 Regular – or most commercially available – honey goes through several processing steps, ripping from it its most precious nutrients: bee pollen and bee propolis (or bee glue). Decades ago, the Chinese noticed that the demand for honey had skyrocketed, and as with many things, started to mass produce honey to get the most money out of it. They started to ultra-filtrate honey to make it clear and more appealing, and easier to handle for the demanding market. However, this resulted in most of its nutrients being filtered out, and what's left is a sugary sweet liquid with almost no health benefits at all. Raw honey is alkaline-forming and still contains all its beneficial natural vitamins, enzymes, powerful antioxidants and other important natural nutrients – all of which are destroyed during pasteurization and filtration. Raw honey is collected straight from the extractor and is unheated, unpasteurized and unprocessed. Antioxidants are very important in the fight against free radicals – harmful and highly reactive molecules that cause cell damage, and are associated with premature aging and the development of many diseases including Alzheimer's disease, arthritis-related conditions, atherosclerosis and cancer. Honey has been used for years as a topical treatment for minor scrapes, cuts and burns. Data suggests that it may help prevent infection due to its natural hydrogen peroxide properties, and that it speeds up the wound healing process. Raw honey is great for digestion as it doesn't ferment in the stomach and has been shown to improve many digestive issues including stomach cramps, indigestion, nausea and constipation. Packed with natural pre-biotics, raw honey stimulates the growth of friendly gut bacteria to keep the intestines clean and healthy. Unlike any other sweetener on the market, raw honey is actually good for our teeth – if used in moderation of course. Researchers have found that bee propolis – the glue that holds everything together – is very effective in the treatment of periodontitis and gingivitis, and limits the formation of bacterial plaque while reducing tooth caries. In fact, ancient Greeks and Romans used propolis as a mouth disinfectant. Honey has long been used as a remedy to soothe sore throats and ease coughing. A 2007 Penn State study found it to be as effective as dextromethorphan, a common cough suppressant. Unlike any other sweetener, honey has a lower glycemic load and helps control blood sugar spikes and insulin levels. However, moderation is key, since one tablespoon contains about 63 calories. Honey has shown positive effects on reducing cholesterol and reducing the risk of coronary artery disease. It scrapes fat and cholesterol from our body's tissues. Use honey topically to treat mild eczema, acne and dry skin. It can be used as an exfoliator, and keeps your skin hydrated, elastic and rejuvenated. This is only scraping the surface of what raw honey can do for you. And again, when buying honey make sure to opt for the real thing. Avoid the clear, processed stuff they sell in most grocery stores; this is fake honey, stripped of all its nutrients.